Ok, by now you realize that Quantic Dream, the makers of Indigo Prophecy and Heavy Rain, are really skilled at creating lifelike virtual people. The tech demo writing is excellent, the voicework is superb, and of course the graphics are most alluring in almost the same level of the first moment I saw Uncharted. 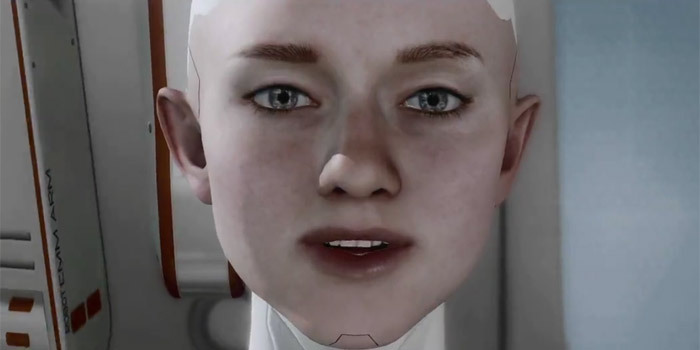 Quantic Dream here invokes emotion in a video game (first of all not an easy task) and for a cyborg without it hitting the Uncanny Valley for me. The Internet demands this tech demo become a full retail product. It's captured my attention away from other games I was playing and has further moved Heavy Rain higher on the list of games in my backlog of games. Wikipedia says the Kara tech-demo was created over a year ago on an earlier engine build and they currently have gotten a 50% feature boost out of the engine. Quantic Dream's tech demo just moved the bar even higher for future PS3 releases. This is really scary. Sure, it's a work of art, but still, the face is scary.